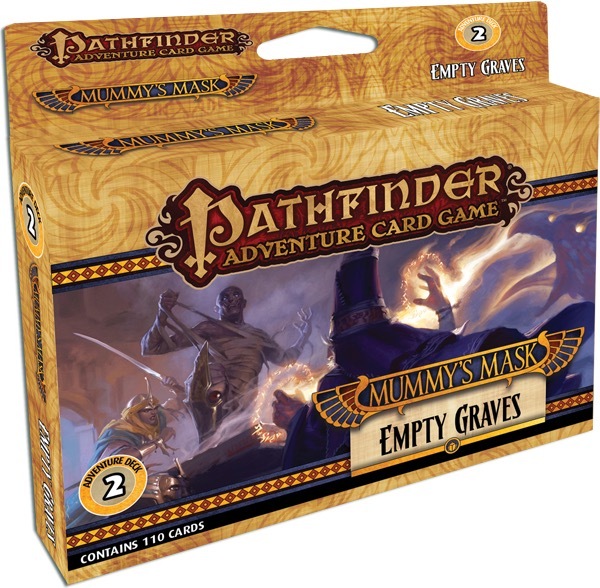 The Pathfinder Adventure Card Game: Mummy’s Mask- Empty Graves Adventure Deck is published by Paizo Publishing. It adds new locations, villains, monsters, scourges, traders, spells and loot. It also adds 5 new scenarios that make up the Empty Graves adventure path. This is based on the Pathfinder RPG adventure of the same name. The main idea behind this set is that there is an evil necromancer that has gained control of a powerful artifact known as the Mask of the Forgotten Pharaoh. With it, he has begun creating an undead army. If the player’s are successful, they will be able to return the dead back to their graves and keep the city of Wati from becoming a city of the dead. This expansion adds 110 new cards to the base game. Just like the original game, the artwork on these cards is all great looking. I’m assuming that a lot of the images were taken straight from the Pathfinder adventure of the same name. There’s really quite a lot of new material included with this one. There are new locations like the Shiny Bauble which allows the player to examine the top card of the blessings deck and if it’s a blessing, they are allowed to encounter it. There are nasty new henchmen like the crawling hands which are immune to both mental and poison traits. Of course that’s just a few of the cards. There are lots more of every type. For me, I like the look and feel of this expansion. It adds more of the undead to the mix in a really cool way. As I’ve mentioned before in previous reviews, I really like all things Egyptian. Of course this expansion is no different. The cards in this one add a lot of new material and challenges of the undead variety. There are lots of new monsters and henchmen as well as a few new villains that will give you a run for your money. There’s also plenty of new allies and items to help you wade through the hordes of the undead. If that weren’t enough the expansion also throws a few powerful spells in the mix to bump up those magic users. Overall this expansion furthers the story line from the first adventure deck and adds plenty of new stuff to customize your characters with. I quite like the direction that this adventure takes you. I would recommend getting it to further your path with. It’s pretty darn good. The Mummy’s Mask – Empty Graves Adventure Deck 2 is a great addition to the Mummy’s Mask set. It adds lots of new cards of every type that look lovely. Thematically this expansion fits right in and looks good doing it. Fans of the Mummy’s Mask set for the Pathfinder Adventure Card Game, will most definitely want to add this to their game. Not only does it further the story, but it helps customize your characters even more. Overall, this is a lot of fun and one that I would definitely recommend. 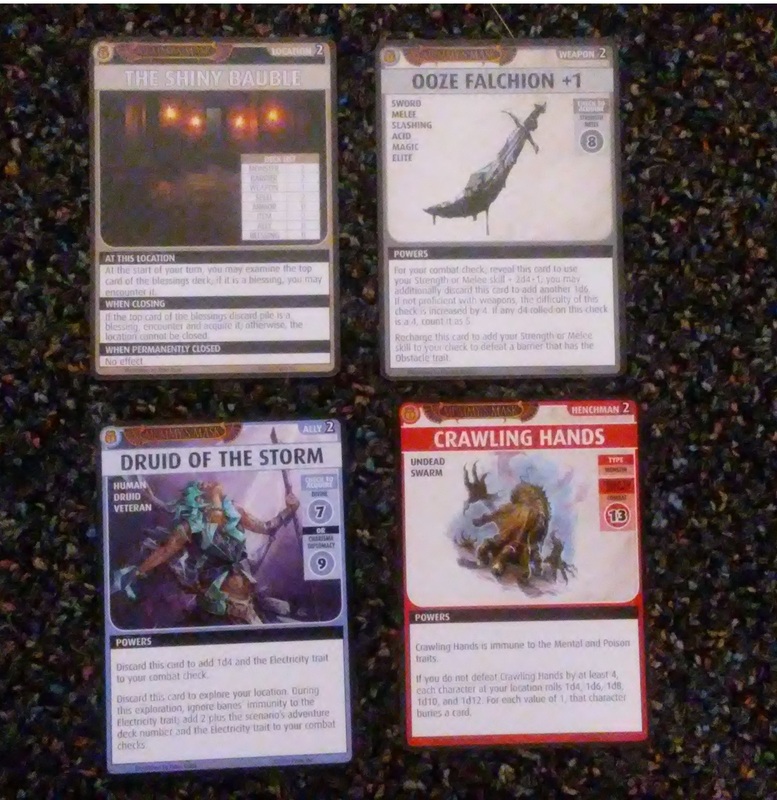 This entry was posted in Reviews and tagged adventure, board, board games, card, card games, empty, empty graves, games, graves, mask, mummy, mummy's mask, paizo, paizo publishing, pathfinder, pathfinder adventure card game. Bookmark the permalink.